Over many years the actual colour of your teeth changes because stains embed deep into the tooth and will end up forming part of it. Tea, coffee and red wine are the worst culprits. Also, as teeth age, the dentine becomes more ‘dense’ and the enamel “shell” becomes thinner giving the teeth a darker more yellowy appearance. Other causes are discolorations due to staining from Tetracycline (an antibiotic) or from fluorosis (too much fluoride ingestion) or hypomineralisation (the tooth has softer patches which stain more easily). Not to mention plaque (bacteria), tartar and decay. How can you improve the colour of your teeth? There are 2 basic ways to improve the colour of teeth. 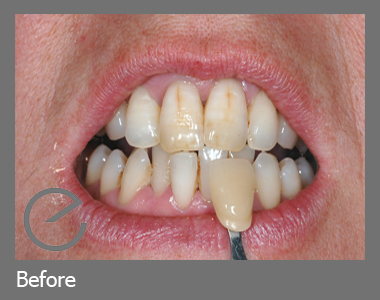 The first is to use Porcelain Veneers and the second is Bleaching. Both of these are explained below. 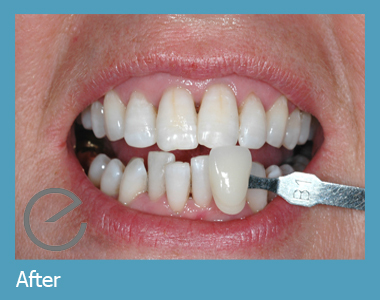 As well as whitening the smile, veneers can be used to correct ugly, crooked or chipped teeth and remove any unsightly gaps. 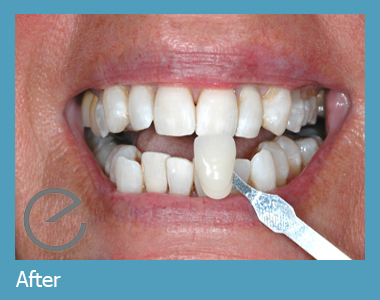 Due to gum recession occurring with age, it may be necessary to replace veneers at 5 – 10 yearly intervals in order to prevent unsightly veneer edges becoming visible at the gum margin. This must be thoroughly understood before extensive, irreversible treatment like veneering is carried out. However, they have the added advantage that the patient can literally choose the shade of their new smile. Truly astonishing results can be achieved, so that you can often appear many years younger. This type of treatment does involve the permanent removal of tooth tissue and is therefore an irreversible procedure. 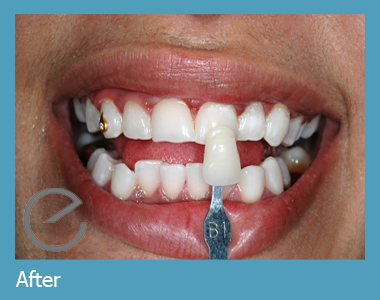 Your dentist will be able to advise as to whether veneering is the best treatment for you. There is a lot more to teeth bleaching than you think! How does tooth bleaching actually whiten teeth? Oxygen penetrates tooth structure and breaks down the long-chain staining molecules (these are dark), resulting in short-chain molecules which are light in colour. It is totally safe to the tooth structure. High concentration bleaches can be caustic to the gums, lips etc.but this is less of a problem since the strength of bleaching gels has been limited in new EU directives. Previously, some in-surgery whitening systems involved applying protection to these areas as the concentration of bleach used could be very high (up to 38%). However, in an EU Council Directive published in October 2012, the concentration of bleach has been regulated and cannot be above 6% hydrogen peroxide, equivalent to whitening gel containing 16% carbamide peroxide.. Poorly fitting whitening trays could lead to the swallowing of bleach and irritation of the gums but the Enlighten trays are specifically designed to avoid these problems. Bleaching must NOT be carried out during pregnancy or if you have large cavities in your teeth. Is there an age limit to bleaching? The current consensus is that there are no age limits to bleaching. Children’s teeth are in fact quite permeable and bleach well. The ideal time to start bleaching a child’s teeth is at the age of 14-16. But tooth whitening is also popular with older people whose teeth have started to become more yellow and stained with age. The dentist takes impressions of your teeth. Deep bleaching trays are made from these impressions in the dental laboratory. You will be given Enlighten Tooth Serum to use as a toothpaste to use both before and during the treatment which helps to strengthen & “seal” your teeth to help prevent sensitivity during the bleaching process. 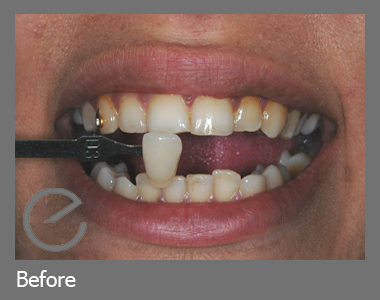 Photographs will be taken to record your natural tooth shade before bleaching commences. The only bleaching tray in existence which seals in the gel and keeps out any saliva is a Deep Bleaching Tray. This was developed over a period of 15 years by a US dentist Dr Rod Kurthy, a world authority on bleaching teeth, and, together with other elements, resulted in the development of the ENLIGHTEN DEEP BLEACHING system. 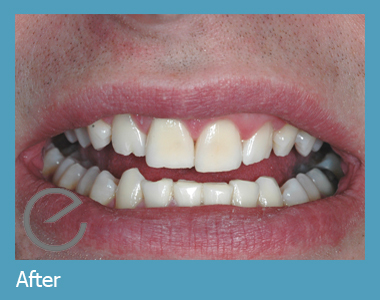 These trays are given to you 10 days after the impressions are taken, together with a supply of bleaching gel. You will sleep with them in overnight, usually for 14 nights. You may also be given a regime to assess sensitivity. At this visit post-bleaching photographs will be taken to compare your final tooth shade with your original tooth shade before bleaching. Future bleaching regimes, specifically tailored to your needs, will then be discussed to maintain your new whiter smile. Why is the ENLIGHTEN Deep Bleaching System so different to other bleaching systems? Historically the biggest problem with bleaching teeth was predictability and sensitivity. You could just never predict who was going to whiten and who was going to be in pain. Dr Kurthy’s Deep Bleaching has dealt with both these issues. This is the only system that will predictably whiten teeth. 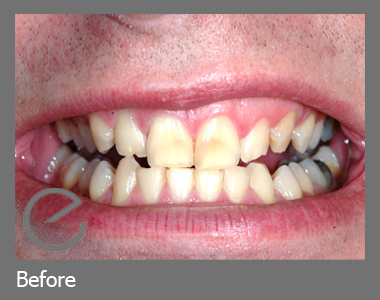 Tetracycline (an antibiotic) stained teeth may take a few weeks longer but great results have been achieved. “I can’t believe how white my teeth are!”, “wow, my teeth!” are just a few comments made by my patients. I have never had this from any other tooth whitening system. As mentioned, because the Deep Bleaching Trays seal so well, very little leaks out to give you a problem. Sensitivity has virtually been eliminated with the incorporation of a sealant as part of the Deep Bleaching Protocol. *Beware of off-the-shelf tooth whitening products! They contain less than 0.1% hydrogen peroxide, and hence there is no chance of changing the intrinsic colour of any tooth. The best you can hope for is the removal of any surface stains (look carefully at the ingredients of ‘whitening toothpastes!). Results are maintained at the same level indefinitely for most people with some simple tray wear, one night every other month. 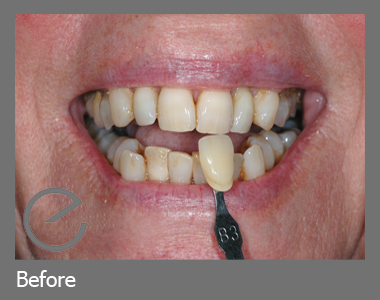 The maintenance regime is important as we can now guarantee both how white the teeth will go and how long they will stay that way. Patients can clearly understand the old maxim “do it once, do it right”. (either upper or lower). £195.00. This will achieve whitening to approx. 4 shades lighter on our VITA shade guide.